Revisiting Provence through Susan Vreeland’s Lisette’s List has me hungry for the sweet melons and salty olives, yearning for the light captured by Cezanne, Pissarro, and Van Gogh, and missing the Mistral wind. Vreeland’s descriptions are so accurate, she must have been there. Like her other novels based on history and art – Luncheon of the Boating Party and Girl in Hyacinth Blue – Vreeland weaves fact with fiction. 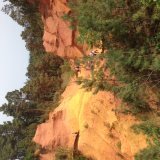 The tale is set in the town of Roussillon, where I recently visited the ochre hills, source of the famous pigment used in paintings. 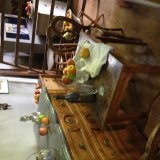 Cezanne, beloved son of Provence, whose paintings were inspired by Montagne Sainte-Victoire, the mountain overlooking Aix- en-Provence, is alive in the story, making my recent visit to his studio, seeing his paint- stained smock and replicas of his famous apples, take on more meaning. In Vreeland’s narrative, Pascal, the old grandfather and frame maker, recalls his friendship with the painter, who traded the paintings now hanging in Pascal’s old house, for frames. The war intrudes on the idyll, as Vreeland uses the paintings hidden from the Nazis as the vehicle for the story’s dramatic arc as well as more travel through the French countryside. Chagall enters the narrative as the war takes its toll on the small towns in Provence, his hiding place from the Nazis, before he escapes with his wife to America. 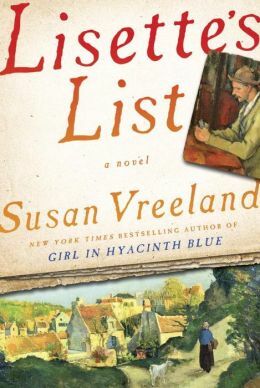 Lisette’s list begins as she is trying to adjust to married life and the move from Paris to the country, but grows into a set of vows marking her independence and her determination to find the paintings and restore both the art and her life. You may enjoy Lisette’s awakening to art through Vreeland’s romantic historical fiction, but her story was too slow and contrived for me. The vivid descriptions of life in Provence were more satisfying than the long hunt for the missing paintings – maybe because I have just been there. Although the book was recommended reading before I travelled, I had forgotten about it until a friend recently reminded me of Lisette. The book brought back the quiet beauty and simplicity of the provincial life, and reminded me of my own wonderful journey. And, now I look forward to more memories of Provence, as I read Iris Murdoch’s Nuns and Soldiers, recommended by another friend who understands my yearning for more reminders of Southern France. Have you read it? This entry was posted in authors, book review, books, historical fiction, history, reading, romance and tagged appreciating art, Cezanne, Chagall, Lisette's List, Nazis stealing paintings, Painting, Provence, stolen paintings, Susan Vreeland, the provincial life, World War II. Bookmark the permalink. I heard Vreeland speak a couple of month’s ago, and bought Lisette’s List. Haven’t read it yet, but I’m looking forward to it! I would love to meet her and compare travels.